Lazarus Risen #1 is out 3/20/2019. By Zack Quaintance — I really don’t think it’s possible to heap enough praise atop writer Greg Rucka and artist Michael Lark’s immersive dystopian near-future comic epic, Lazarus. I recently re-read the entire series, and once I got about mid-way through the second volume, I almost literally could not put it down. The world is so well-built, the characters compelling and complex, the dilemmas they face suspenseful. All in all, this is one of the smartest and most compulsively readable comics on the market, a must-read for any fan of the medium. To date, there have been 28 issues of Lazarus in the main series, plus a six-issue auxiliary series titled Lazarus: X+66, which fills in the gaps of side characters and the story’s broader world over the course of a 12-month period. All told, that’s about 34 incredible issues of content, plus some other supplemental material with more information that help support a Lazarus RPG. 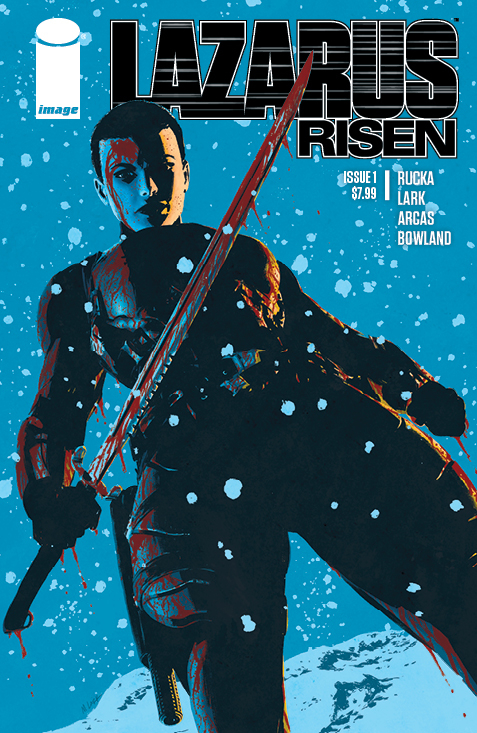 This is all a means of saying that even though Lazarus: Risen #1 is a a new #1 issue, it’s set in a thoroughly explored world during what seems like not-quite the midway point of a long story. The reason this issue gets the new #1 treatment is that the book is back with a new format: quarterly releases that clock in at an extended length. Let me start this review (three paragraphs in, streamlined I am not) by noting that the story, artwork, plot, and characters are just as strong as ever. The quality in Lazarus never wavers, not even a little bit. Rucka and Lark are a skilled and veteran team that have worked together for years, and it shows. This is the most fully-formed comic on the market—bar none—and as a result it often feels like the creative team is a conduit for the truth of this plot. Nothing is ever contrived, not even a bit, and Lazarus Risen #1 is no exception. It’s as compulsive readable and utterly immersive as all that’s come before it. So, what then of the new format? Surely, it must have changed something. I suppose it did. Rucka and Lark being such a veteran creative team means each issue of Lazarus to date has tread that rarefied ground in which the individual chapters feel both episodic and part of a larger narrative. Each issue has story beats and damn near close to a three-act structure. Extending the length allows the team to pace the story just a tiny bit differently, opening up a few pages for quieter and more subtle character work and plotting. Rucka points this out in publication, but in this issue that means we get a very telling moment between Bethany Carlyle and and her husband. It’s the type of scene that maybe didn’t fit into any of the tighter issues of the past. This issue hums along, and Lazarus remains the type of comic you start, blink, and realize you’ve devoured...before going back to pour over every page again. Few comics feel as real as this one, and Lazarus Risen #1 does a number of interesting things with the ongoing plot and characters, moving pieces into place that speak of a larger coming battle, at home and with the forces abroad. It’s not really a jumping on point for new readers—indeed, the previous five volumes at minimum are necessary here—before for those who have followed this journey in recent time or come to it lately, this comic is everything they could hope for from a return. Get caught up on the book with our Lazarus Retrospective!